This bar of the future also needs sauce. In fact, it could use maybe a good helping of sauce and some filling. Why can’t they make a bar of the future a little bit more moist? I remember from way back in my youth, Carnation had these Breakfast Bars (sadly, now discontinued) which were packed full of tasty and they were moist. I loved those things, I’da eaten them for breakfast, lunch and dinner. Those little inclusions which I mistook for toffee bits? Are almonds. Almonds are not a nut that’s going to help if your product already has a dryness problem. In fact, I think they sort of add a nutty gritty to the pasty dry. I also had to look them up in the ingredients to figure out what they were when I decided they were not toffee bits. This can not be a plus for their almondness if I can’t tell what kind of nut I’m eating. Meh. I also can’t say that I’m really fond of the caramel flavoring. Flavoring being the word to describe Healthy Club/Hamada’s attempt at hitting caramel by combining various flavor chemicals in the lab. 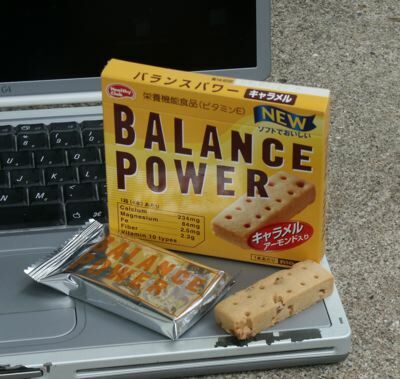 Balance Power’s caramel tastes more like cheap butterscotch flavoring and that’s not endearing me to their Balance Power cause. At least there was no lingering aftertaste. I was looking forward to trying the caramel Balance Power out but now that I have, I think I’m going to recommend cacao over caramel. 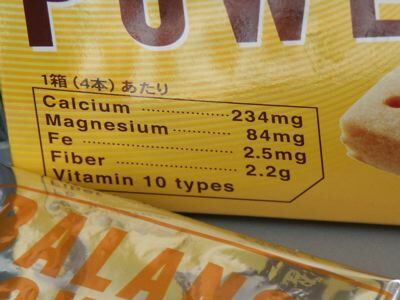 The Caramel Balance Power is better than the Calorie Mate but not by much; you’re probably better off hunting something else up to eat for your bar of the future cravings. Wow. Three is higher than I thought they deserved. Bleah…. 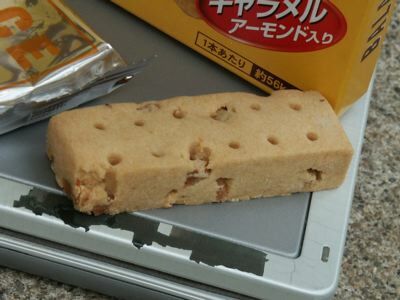 Actually, these are quite delicious if you treat them like they are – simple flavored biscuits. These are fantastic if you dip them in tea prepared in the Indian way (Black tea + milk and sugar). Also, the chocolate chip ones (I think that’s what they were, as I can’t read Japanese) were by far the best of the ones I tried – two were primarily chocolate based (darker cookies) and weren’t quite as nice. The fourth was a different brand (Calorie Balance: Fruit) which was also pretty good. All in all, 3 is probably a fair rating, but you may get more mileage by making them moist on your own. The blueberry is the best. But it is very hard to find even in CA with all the Japanese stores.